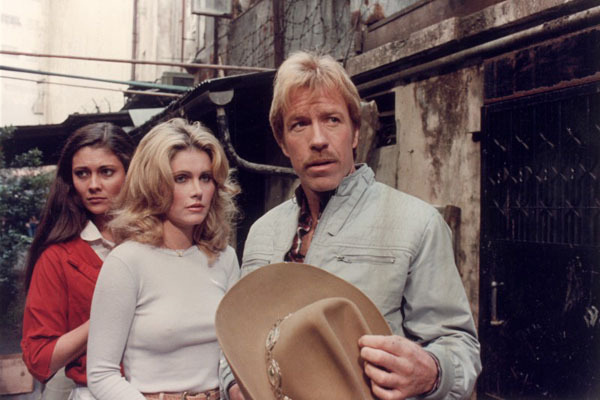 Chuck Norris stars as Josh Randall, a military vet now working for Sam Paschal, a Jewish casino owner in Hong Kong. Josh does work getting folks who owe Sam money to pay up. In most other films a character like this would be the villain, but here he’s the good guy. He has a smoking hot girlfriend Claire, who lives with him on a boat, and life seems to be good. And then once you remember this is a Chuck Norris film called Forced Vengeance, you just wait for things to head south, and they do really fast as Sam’s son David tries to make a deal to merge the casino with a local casino baron and member of a secret organization called Osiris. When Sam refuses, of course he and his son are killed, and Randall finds he has to protect the only other owner, Sam’s daughter Joy. Randall and Joy, along with Claire find themselves on the run until an ambush causes Randall to go on the attack, and now he’ll have to kill his way to the leader of Osiris to stop them once and for all. Forced Vengeance plods along at the beginning until Sam and David are killed, then the film moves faster, but you’ll have to deal with bad acting until them. Chuck is…well, Chuck, and he’s not a good actor but he has a screen persona that works well in this. The women are there mostly for eye candy, and work well for that, but they don’t anything else but run around with Chuck bra-less and scream a lot. The villains are cookie cutter and the steps they take to kill Joy and Randall doesn’t seem to match with their ambitions. The fight choreography is not too imaginative, and has no flow or any real complexity. Aaron Norris keeps things simple, and even the best fight toward the end between Chuck and a nameless thug is pedestrian at best. I take that back. 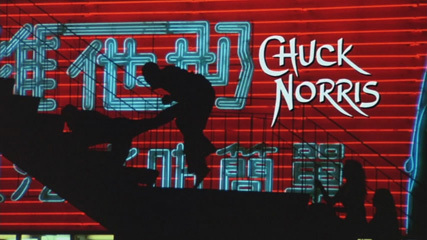 The best fight is a fight we never really see as Chuck fights a guy that we only see as their silhouettes near a neon sign. Most American fight choreography of the early 80’s were like that, but there are still ways it could’ve been done better. Little did anyone in the United States know that at the time Jackie Chan and Sammo Hung were redefining what fight choreography was and could be. Forced Vengeance is a mediocre film that doesn’t seem to aspire to be anything more. It isn’t even a good showcase for Chuck Norris’ skills. CHOREOGRAPHY: (3) Barely passable, but then again I’ve never been a fan of Aaron Norris’ fight choreography. STUNTWORK: (5) The stuntmen don’t really have to do much here. They take a few spills, but not much more than that. Their stuntwork matches the film’s ambition. STAR POWER: (7) Chuck Norris, and that’s it. Still potent, however. It must be the moustache. Richard Norton has a small role, but no martial arts. FINAL GRADE: (5) Forced Vengeance is an average film that has no ambition except to be a by the numbers action film with Chuck Norris as the star. Chuck is the only thing quality about this film.